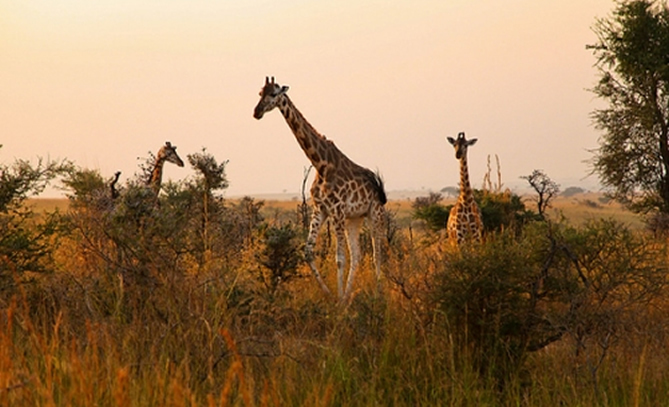 When To Visit Queen Elizabeth National Park? Are you are interested in game viewing safari in Queen Elizabeth National Park and you do not know when to visit? If there are a few most spectacular safari destinations that you should pay a visit in Uganda then Queen Elizabeth National Park is one of them. 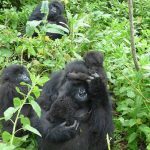 While the park is regarded as an all year round safari destination for wildlife viewing, note that there are perfect times compared to others and this must be put into consideration if you are planning for your next trip to this splendid tourist site. The dry season features as an ideal time for tourists to embark on their preferred safari activities at this park especially game viewing and chimpanzee tracking that make up a major highlight at the park. The dry season start from June to September and this is usually regarded as a long dry season while the short one starts from December to February. Note that this season requires you to come along with warm clothes a fact that game drives are conducted early the morning and where you will engage in night drives to look out for the nocturnals and it can be very cold. The long rainy season on other hand begins from March to May and the short one from October to November. However, this is the best for birders to catch a glimpse at numerous bird species while on safari at Queen Elizabeth National Park a fact that most migratory avian species confine into this conservation area. Besides diverse bird species, this season also comes with stunning sceneries in and around the protected area which offer breathtaking sceneries. This season equally require warm clothes. In summary, you can perfectly visit this park from June to August and also in January, February and September. Its high season usually starts from June to July while the low season begins from March to May and October to December and these come with heavy rainfall amount which at times makes it very challenging for visitors to undertake their adventures at the park. The perfect weather conditions stretch from June to September while its worst weather conditions are always registered around March to May. The dry season experiences about 28 degrees Celsius and reduces to 15 degrees Celsius at night. During rainy season, temperatures range from 28 degrees Celsius especially in the afternoon and they reduce at night to 16 degrees Celsius in the morning. 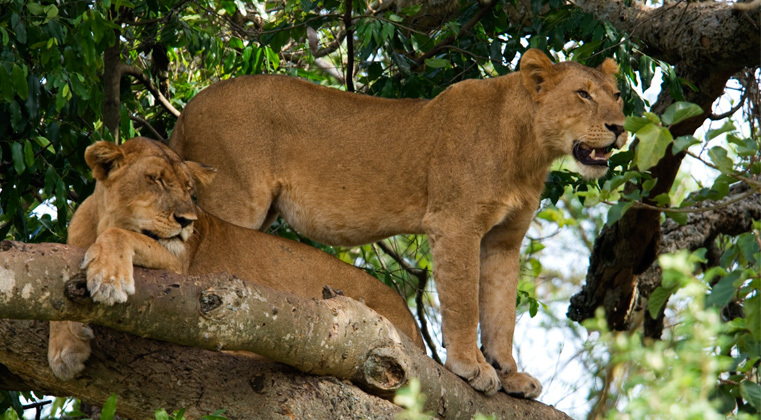 Queen Elizabeth National Park expands for about 1978 square kilometers and this makes it Uganda’s second largest national park. It lies along the rift valley floor just between Lake Edward and George. It is popular for its over 95 mammal species and 620 bird species and this makes it one of diverse savanna grassland protected areas. Its sceneries feature mainly spectacular vegetation, wildlife, Lakes, mountains which are located around the park borders. 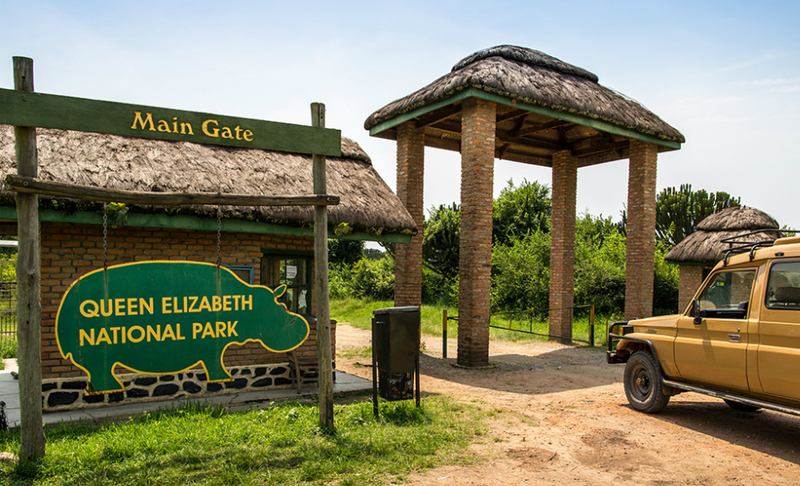 This park comprises of five different vegetation types-the bushy grassland, swamp vegetation, forest, acacia woodland and wildlife species elephants, warthogs, leopards, hyenas, chimpanzees, tree climbing lions, Uganda Kobs and many others. 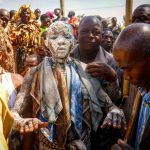 It straddles along the rift valley and its elevation ranges from 480 to 1390 meters. It is situated along the Equator and its low elevation and proximity at Equator comes with warm temperatures which range from 18 degrees Celsius to 28 degrees Celsius. This park receives rainfall amount of 1250 mm and this is normally between March to May and October to November. Therefore, Queen Elizabeth National Park is one of Uganda’s most splendid savanna grassland conservation areas that you should pay a visit while you are on safari in Africa. The best time to visit this park all depends on your interests however, the dry season is preferably the best but you can also travel during wet season.